Beautiful. Stunning. Marvelous. Exquisite. Wonderful. All of these adjectives can be used to describe one of the most anticipated new television series in years. And you thought I was just talking about Sam Heughan! 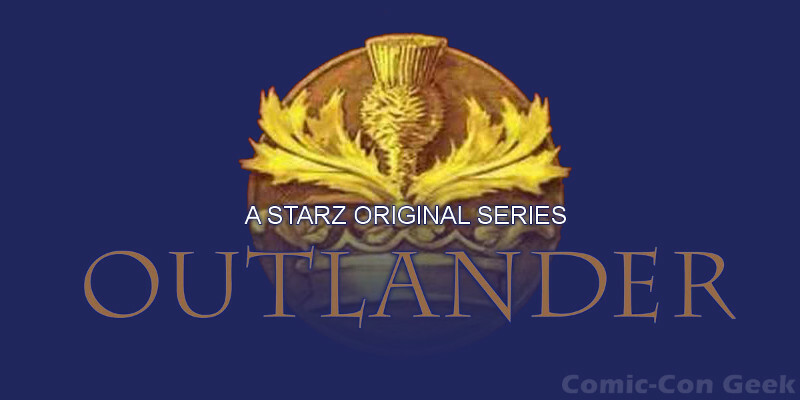 In all seriousness, I believe that all of these descriptors can be applied to Outlander from the perfectly eerie and moody backdrop of Scotland, to the transformation of the novel to television screenplay, to the casting that seems to have captured the characters from Diana Gabaldon’s novel with a real authenticity. In the second episode, Claire arrives at the Castle Leoch and her first significant introduction is to Mrs. Fitzgibbon. Mrs. Fitz (as everyone calls her) runs the castle and appears to accept Claire as a new guest to the castle, with just a wee bit of wariness. As Claire checks on the condition of Jamie’s earlier battle wounds, he tells the story behind how he came to be flogged at the hands of Captain “Black Jack” Randall. As Claire’s disbelief of the reality of her situation turns to acceptance that she is no longer in her own time, Claire finally breaks down in Jamie’s arms. Unlike in the book, we get to see the filling out of Claire’s musings about Frank, how worried he must be now that he’s realized that she is missing, appearing to have vanished into thin air. The next day, Claire is brought to “Himself”, otherwise known as Colum Mackenzie, the laird of Castle Leoch. Claire arrives in his room and discovers that she has a few moments to herself. As she rifles through books and papers on his desk, she finds the confirmation that she needed. She discovers a letter on his desk, dated 1743. Before she can do anything else, Colum enters and begins to deftly question Claire about who she is, where she’s from and how she managed to end up in the clutches of Captain Randall. Colum interrogates Claire under the guise of caring and concern for her well-being, but it is clear that he has ulterior motives. At the end of the conversation, there is a slight deviation from the book, when Colum tells Claire that she could catch a ride with a travelling merchant who should be passing by at the end of the week. Claire leaves this meeting believing that she’s a week away from getting back to Craigh na Dun, and she seems to become almost ambivalent about her situation. After the meeting, Claire spies a moment of playful fun between Dougal and a young boy in the courtyard. Mistakenly thinking that she was witnessing a touching father-son moment, Claire later realizes her error when she is officially introduced to Hamish Mackenzie, “son and heir to Colum Mackenzie”. She quickly excuses herself from the dinner table, before she makes anymore errors in judgment. The next day, Claire goes to check on Jamie at the stables and hears more of his story. Jamie reveals to her that he is an outlaw, wanted for murder, and living under an assumed name. After hearing about Jamie’s precarious position, hiding from the Redcoats, with a bounty on his head, Claire asks him why he chose to share his story with her. His reply simply stated, “You asked”, and that he “decided to trust” her, rather than hide from her. At the end of this scene, we also see how Claire’s being watched by Dougal’s men everywhere she goes. Later in the episode, Claire witnesses Jamie intervene on the behalf of the young girl Laoghaire who is to be punished by Colum for displaying “loose behaviour and morals”. Laoghaire was to receive the strap in front of everyone attending the hall. 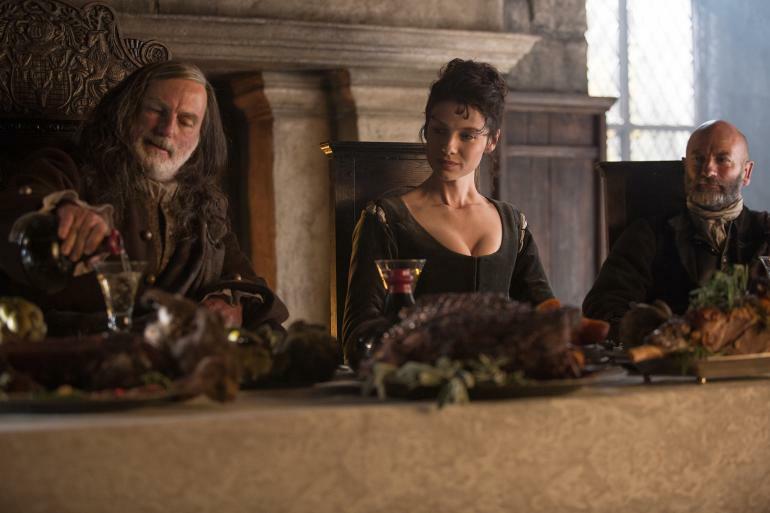 It is clear that Jamie’s intervention is received with suspicion by both of his uncles Colum and Dougal, and that Murtagh is clearly a confidant of Jamie’s. 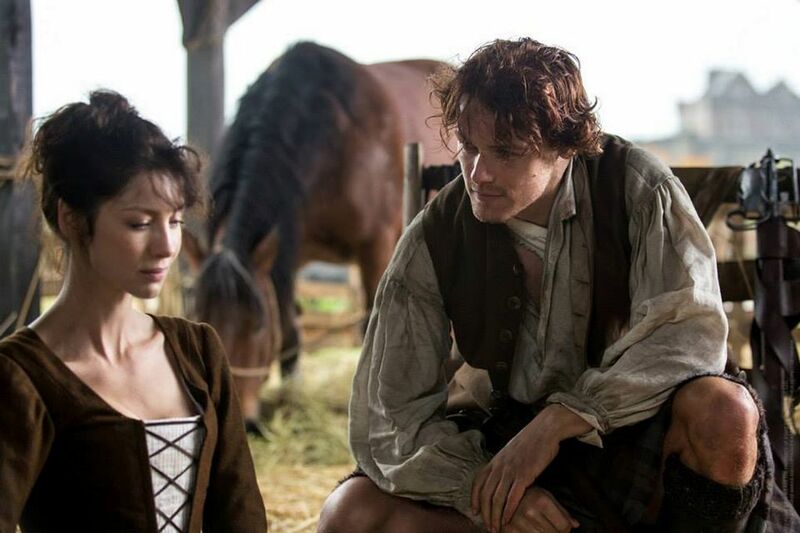 Claire, also begins to suspect that perhaps Jamie is the cause of Laoghaire’s punishment, as she ponders why he would save her from the humiliation. At the end of the episode, just as Claire is about to leave with the travelling merchant, Dougal comes for her, and Claire experiences deja vu as Dougal brings her to a room in the Castle that Claire had explored with Frank. It is in this room that Claire and Frank had a very intimate moment in 1945, that Colum reveals his grand plan for her. Colum has decided that Claire is to remain at the castle as the local healer. This does not sit well with Claire, but Colum makes it very clear that she will remain at Leoch until he is sure that she poses no threat to him, his family, or his clan.